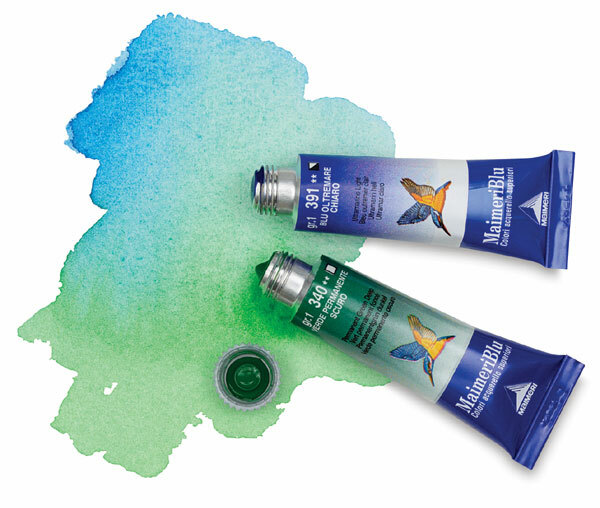 Maimeri was founded in 1923 by noted Italian impressionist painter, Gianni Maimeri, who was searching to satisfy his own burning desire for artistic excellence in paint. The result of his passion is a line of highly concentrated, lightfast watercolors with performance unlike most of their mass-produced counterparts. Every color is made with the best binder available — a gum-arabic from Kordofan, in the Sudan region. The result is an almost completely clear and elastic medium, totally soluble in water, yielding the purest and most brilliant tones. Choose from an outstanding palette of 72 colors set in 15 ml individual tubes and experience the rich tradition of colors like those treasured by ancient masters and appreciated by modern Italian painters for more than 80 years.